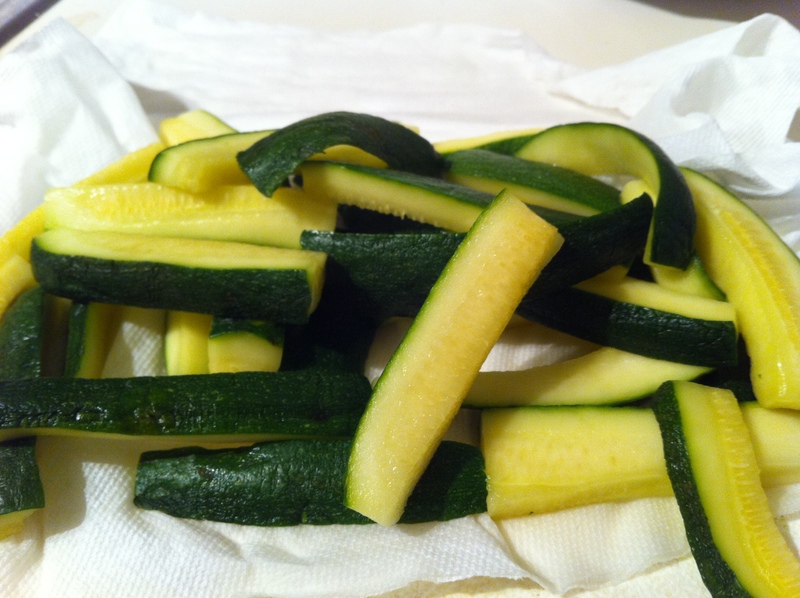 Zucchini is a great vegetable that is readily available and especially cheap when it’s in season in the summer. Oddly enough I get into a rut when it comes to using it. I love grilling it in long strips and throwing the leftovers in an antipasta salad the next day, cubing it for kabobs, or sautéing it with a little oil and garlic. But that’s where my mental block begins! There is a place that I absolutely love here in Orlando called Graffiti Junktion. Aside from their amazing burgers, they make the best zucchini fries served up with a dish of spicy remoulade similar to the dressing you’d get with a blooming onion. I have eaten an entire bacon cheddar burger and split an order of zucchini fries a few occasions. It could possibly be the best hangover helper I’ve ever encountered. However, sometimes your body tells you that you need to forego the beef patty the size of your face and all of the deep-fried goodness. 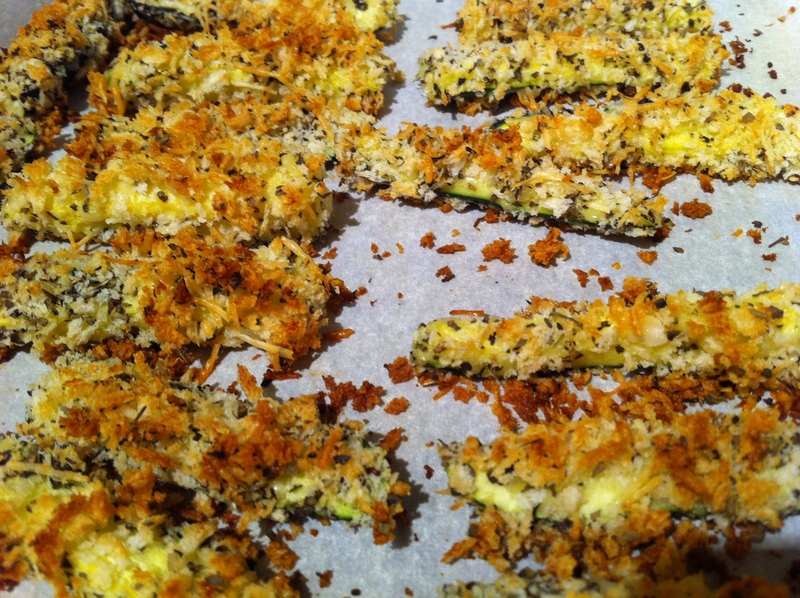 This recipe by no means replaces the Junktion’s zucchini fries, but it does make for a nice substitute you can make at home and feel good about. 1. Toss your zucchini sticks in a liberal amount of salt. Leave them in a colander over the sink for at least an hour. This will release excess water in the zucchini, so they come out more firm than mushy. Watch the magic happen! 2. After the zucchini have done their thing, rinse them well to remove the salt, then thoroughly pat them dry with paper towels. 3. Preheat your oven to 425 and line a baking sheet with parchment paper. 4. Beat your eggs in a bowl large enough to dip your zucchini sticks in to coat them. 5. 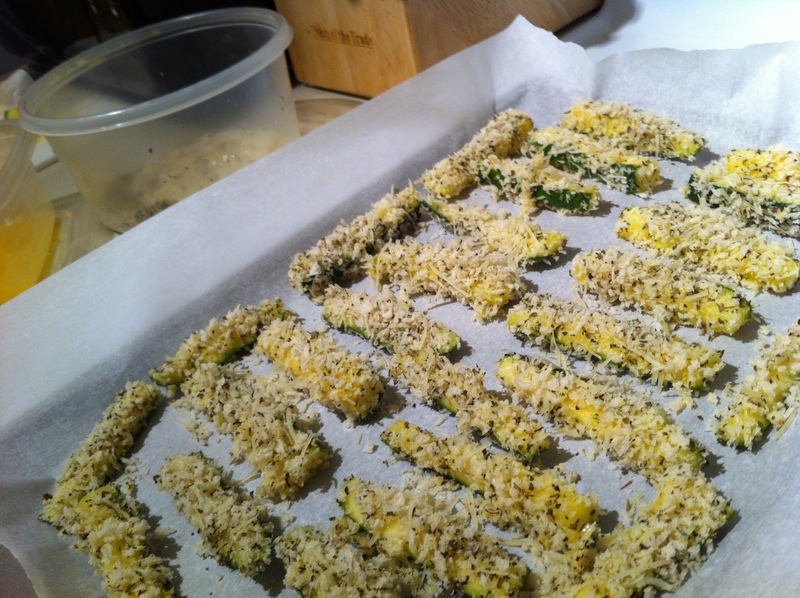 Mix the bread crumbs, parmesan, and herbs in a separate dish large enough to dredge the battered zucchini in. My favorite method is to put this into a large Tupperware container (the kind I’d use for a salad), then add no more than 2 or 3 sticks at a time. Hold the container over the sink and gently knock the sides with your hand to coat. 6. Place the sticks on your baking sheet with just enough room so that they don’t touch. Bake for 12-15 minutes before flipping and baking for another 12-15 minutes, or until they are golden all around. Serve them up with your favorite dipping sauce!